Last season Micah Mason, of Duquesne, led the nation in three-point percantage. Which incoming freshman will compete for the three-pont percentage title in the near future? Here’s a list of the top 10 shooters in the 2014 class. 1. James Blackmon — In my opinion, Blackmon, a 6-foot-3 guard out of Marion (Ind.) High, is the top shooter in the 2014 class. 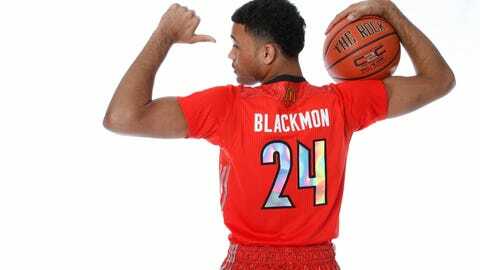 Blackmon, who signed with Indiana, shot 48-percent from three in the Nike EYBL and 47-percent from three at Marion during his final high school season. His stroke is smooth; he has good range on his shot and a pretty quick trigger. To go with his long-range shot, Blacksmon is a capable shooter from mid-range and continues to gain comfort making shots from that level. 2. Robert Johnson — This time last year, Johnson wasn’t ranked in Scout.com’s top 100, but after a strong showing at NBPA Camp in June, Johnson began to inch his way up the rankings. At 6-foot-2, Johnson is a combination guard and is best attribute is his ability to shoot. His range is deep and his shot is consistent. Just like Blackmon, Johnson is headed to Indiana. He’ll spend some time on the ball at IU, but he’s most effective off of it so he can fly off screens and make perimeter shots. 3. Matthew Fisher-Davis — Fisher-Davis emerged late last July at the Peach State Classic in Augusta (Ga.). Since then he’s grown to 6-foot-6. Fisher-Davis shot 49-percent from three and 97-percent from the free throw line during his senior season. He has a very quick release; impressive range is a good mid-range shooter as well. Fisher-Davis will play his college career at Vanderbilt. 4. Trevon Bluiett — Chris Mack and Xavier stole one out of Indiana in the 2014 recruiting class. A 6-foot-5 wing, Bluiett is a high-level scorer, who pumped in 36.2 points a game as a senior at Indianapolis (Ind.) Park Tudor. He shot 38-percent from three in EYBL last summer and hit 41-percent of his 168 attempts during his senior season. His release is quick and despite being just an average athlete, Bluiett rarely had an issue getting his shot off at the high school level. 5. Devin Booker — Kentucky signee Devin Booker has one of the purest strokes in high school basketball. The 6-foot-5 guard out of Moss Point (Miss.) High has a consistent shooting stroke from long-range and is able to get his shot off quickly. Booker showed well recently at the McDonald’sAll-American practices, especially from a shooting standpoint. Over the course of his high school career, he’s continued to show improvement off the dribble and from mid-range as well. 6. Romelo Trimble — When Mark Turgeon and Maryland reeled in Romelo Trimble, he immediately added one of the best shooters in the 2014 class. Trimble shot in the mid-40’sfrom three during his senior season at Arlington (Va.) Bishop O’Connell. While he’s known as a shooter, Trimble is more than just that. He’s an equipped scorer that can make mid-range shots and score at the rim. 7. Jared Nickens — A long, wiry wing prospect out of Westtown (Pa.) High, Nickens is a terrific long-range threat. His shot is effortless and much like the rest of the guys on this list, Nickens is able to step well away from the stripe and making jump shots with consistency. I saw Nickens, pump in six threes in a game during his senior season and he made it look easy. Nickens will also play his college basketball at Maryland. 8. Trey Kell — The 6-foot-4 guard headed to San Diego State is ranked No. 13 at the shooting guard position. When he has time and space, Kell is a lights out shooter. He has good form, is a capable mid-range shooter and seems to know how to get open. 9. Brady Ellingson — Ellingson, an Iowa signee, broke out during his final summer playing with Ray Allen Select. The 6-foot-4 guard showed an impressive ability to shoot the ball on the move. He has good shot preparation, is able to set his feet quickly and gets his shot off with ease. During his senior season he shot 45-percent from three. 10. J.P. Macura — Macura, a Xavier signee, is certainly one of the top perimeter threats in the 2014 recruiting class. He has good size at 6-foot-5, is a decent athlete, but most importantly for this classification, he can flat out shoot the basketball. His range is deep and he shoots well on the move, but he’s also more than capable of making pull-up jumpers.